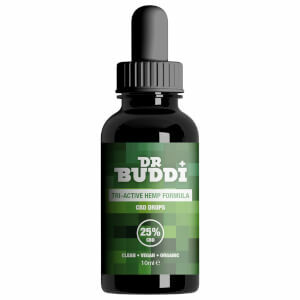 Treat ailments naturally with the premium strength CBD Oil 25% Gold Edition from KIKI Health; a lightweight vegetable-based oil enriched with a 25% concentration (highest strength option) of Cannabidiol Oil extracted from the tops of fresh hemp plants, which is then mixed with Hemp Seed Oil. Unlike THC (the mind-altering component found in cannabis), CBD is the major non-psychoactive component of the plant that is linked to a growing list of medical benefits from calming anxiety to relieving nausea, pain and inflammation. Rich in terpenes (fragrant essential oils found in plants), the oil boasts a pleasant taste. Shake before use. Put 2 – 3 drops under the tongue 3 times a day and keep in your mouth for a minute before swallowing. Swallow after 90 seconds. Do not exceed 20 drops per day/in a 24 hour period. CBD Oil can also be mixed with water. CBD (Cannabidiol) full plant extract (80%), Hemp Seed Oil (20%).